Location/Climate: On the north shore of Kachemak Bay, 125 air miles southwest of Anchorage. 24" /yr. precip., 14°F60°F. Population: 4,133 (3.6 percent native). Travel Attractions: Access to Kachemak Bay and Kenai Fjords, ferry link, interesting town, Pratt Museum, Alaska Maritime National Wildlife Refuge visitor center. Getting There: Vehicle access via Sterling Highway (AK 1) from Kenai, Anchorage; scheduled ferry service from Kodiak, Seward; scheduled air service from Anchorage. 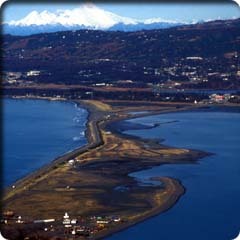 Information: Homer Chamber of Commerce, 135 Sterling Highway, Homer, AK 99603, 235-7740, www.homeralaska.org. Homer has long been a favored destination for visitors to the peninsula. It represents the end of the road for the Sterling Highway (AK 1), though a lesser route (East End Road) continues eastward high above the north shore of Kachemak Bay. The A.M.H.S. ferry offers access to Seldovia, Kodiak, Seward, and points beyond, while Jakolof Ferry Service and other companies serve Kachemak Bay (see the Appendix). Homer was named for Homer Pennock, a gold-seeking adventurer from New York who arrived with his compatriots in 1896. The town grew into importance as a safe harbor near the rich fisheries of Kachemak Bay and the lower Cook Inlet. 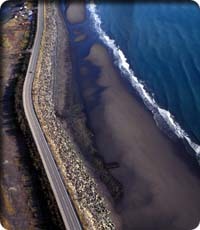 The Sterling Highway reached Homer in the early 1950s, linking it to Anchorage and the rest of the peninsula. Pleasant Seldovia is just across Kachemak Bay, while Augustine and Iliamna Volcanoes are visible across Cook Inlet. Homer is a busy commercial-fishing port and is famous world-wide as a center for halibut sport fishing. Its also a bit of an artists colony, adding an important ingredient to the towns blend of hard-edged fishers and builders, halibut-hungry recreators, car tourists, and backpacking explorers. Several galleries are found in or near town. Though Homer lacks a real town center that makes you want to park your car and walk, its still a great place to spend some time. Homers most distinctive feature is the Homer Spit. In an age-long effort by nature to smooth the rough edges of the coastline, the currents of Cook Inlet created this sandy, 4.5-mile projection into Kachemak Bay. Early residents built a road and buildings along the spit, only to find that the sands tended to shift in response to storms, earthquakes, and time. The 1964 quake reduced its width by as much as two-thirds. Since then, efforts have been undertaken to stabilize the spit with rocks and breakwaters. Along Homer Spit Road youll find charter companies, gift shops, fishing spots, marine businesses, lodgings, and camping areas, as well as the famous Lands End Resort and the infamous Salty Dawg Saloon. Most tours, fishing trips, and Kachemak Bay shuttles leave from the spit, as does the ferry. Alaska Maritime National Wildlife Refuge Visitor CenterThe vast Alaska Maritime National Wildlife Refuge encompasses hundreds of islands and thousands of square miles of ocean, making it virtually impossible to visit in any traditional way. The visitor center offers an overview of the preserve, as well as details on local activities. Refuge rangers offer guided coastal walks many mornings at Bishops Beach and Lands End. The walks examine bird or intertidal life. Visit the center or call about walk times: 451 Sterling Highway, Homer, 235-6961, 235-6546 (refuge manager), www.r7 .fws.gov/nwr/akmnwr/akmnwr.html. Pratt MuseumOperated by the Homer Society of Natural History, the museum includes living marine exhibits, the Cultures of Kachemak Bay exhibit, and a homestead cabin. An excellent exhibit on all aspects of the Exxon Valdez oil spill is found in the basement. Outside there’s a small botanical garden and a nature trail. 3779 Bartlett Street, 235-8635, www.prattmuseum.org; open mid-Maymid-September daily 10 a.m. to 6 p.m. (ThursdaySaturday until 8 p.m.); winter hours TuesdaySunday noon to 5 p.m., closed in January; $4. Salty Dawg SaloonBuilt in 1897 as one of Homers first cabins, half of the present-day saloon was once the towns first post office and, later, the railroad station, a grocery store, and a coal mining office. A second building, built in 1909, also served as a post office and grocery, as well as a schoolhouse and family home. The buildings were joined and made into a saloon in 1957, then moved to the present location after the 1964 earthquake. Though the years have softened its edge, the Salty Dawg still lays claim to a surly reputation as a hangout for the rough and rowdy. Scuffle into the small, dark bar through the wood chips and smoke. Sit down at one of the thick-topped plank tables, knife-etched with initials from 10,000 nights of drinking. Order quietly and wonder if the ragged fisherman at the bar will sneer at your teal and purple GoreTex jacket. Enjoy. Look for the fake lighthouse on the left side as you drive out. Bay View Inn, Mile 170 Sterling Highway (800) 478-8485, 235-8485 (AK only). Great views, nice rooms, $80 and up in summer. Homers Finest Bed and Breakfast Network (reservation service), (800) 764-3211, 235-4983. Save yourself some legwork when looking for available rooms in area B&Bs. Lands End Resort, 4786 Homer Spit Road, (800) 478-0400, 235-0400. $110$160 MaySeptember, $93$123 winter. Famous hotel at the tip of Homer Spit. Nice rooms, restaurant, deck, great views across Kachemak Bay. Lands End RV Park, 4786 Homer Spit Road, 235-0404. $14$23. Near end of Homer Spit, best option for campers or RVs on spit. Ocean Shores Motel, 3500 Crittendon, 235-7775. Basic rooms $95 and up in summer. Kitchenettes. Seaside Farm, 58335 East End Road, 235-7850. Hostel $15 per person; tentsite $6; $55 and up for a cabin. A wonderful hostel with camping and a couple of rustic cabins on the shores of Kachemak Bay. Bring your own bedding (rental $3). Cafe Cups, 168 W. Pioneer Drive, 235-8330. Youll know it when you see it. Open 7:30 a.m. to 10 p.m. Neon Coyote Cafe, 435 Pioneer Avenue, 235-6226. Good prices and great food. Two Sisters Espresso and Bakery, 106 W. Bunnell, 235-2280. Espresso, baked goods, art gallery, great place to muse.